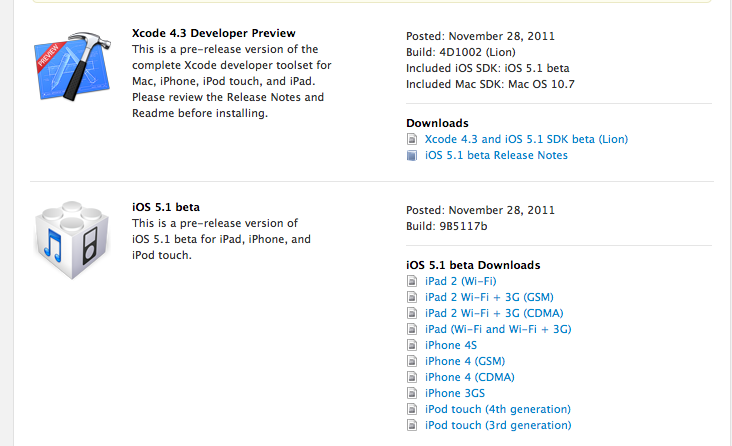 Apple has today seeded iOs 5.1 beta and Xcode 4.3 to developers. This release addresses some bugs but in the end appears to have no significant changes in the release notes. According to iPhone hacker iH8sn0w, today’s iOs beta expires on Saturday January 14th, 2012 at 8PM. Expiration dates often indicate the release date of the next beta or a finalized version of that version. This is not a guarantee, however, that we will not see another version before January 14th. According to Brian Klug of Anandtech, the baseband of the iPhone 4S gets an upgrade to 1.2.01-1 with this update. This may serve to hinder unlocking efforts. There are some under-the-hood additions to the tools available for developers to use in their apps though. One of those is the addition of alternative interpretations for Dictation input. Since there is currently little documentation about this API change, it is hard to say for sure what this would allow developers to do. But, at this point it appears as if this would allow for alternative interpretations of a Dictation phrase to be used by an app if the audio isn’t clear, or if the Siri server has sent back multiple possible interpretations of an audio input. This could be useful in situations where there is limited text entry options. It would allow users to pick from multiple possible answers to a query by the app, as there could be no way for them to correct the text by hand. If you are a developer, you can log in to Apple’s Developer Center to download the beta now.